Sclerotherapy is used to eliminate varicose and spider veins by injecting a solution directly into the vein. Liquid – Liquid agents are injected directly into the affected veins, using a very small needle. Some agents include local anesthetics to enhance patient comfort during the procedure. This type of solution is used commonly for the smallest types of spider veins that are easy to trace on the surface of the skin. Foam – Foam agents are a relative newcomer to the sclerotherapy treatment technology, offering greater versatility for this procedure. Foam solutions displace blood from the treated vein, allowing for more effective treatment of the vein walls. In addition, foam can be traced in the vein via ultrasound imaging, allowing the physician better precision in treating larger veins located deeper in the leg. Ultrasound – Ultrasound-guided sclerotherapy provides even more options for patients seeking treatment for small veins. This technology uses sound waves to produce an image of the vein, allowing physician’s to treat varicose veins that cannot be seen on the skin’s surface. It also ensures greater precision throughout the procedure, as the physician can trace the path of the sclerosing agent to ensure full closure of the vein. Bruising at the injection site – Commonly happens in the area of spider vein treatment, but resolves after 1-2 weeks. We work to minimize this. Allergic reaction to the sclerosing agents – Rarely you can have an allergic reaction that may cause itching and or hives. This is treated with anti-histamines. The appearance of blisters, scabs or scars – Rarely the sclerosant medication may infiltrate the skin and not the vein. This can cause slight scabbing. We treat this immediately to prevent scarring. Hyperpigmentation of the skin in the affected area – This is a small brownish discoloration at the skin site from slight bleeding. This will resolve in a few months. We can treat this as well. Blood clots – In extremely rare cases, you could develop a DVT and even more rarely a Pulmonary embolism. Please call us immediately if you develop any chest pain or shortness of breath. Telangiectatic matting – This is a collection of extremely small spider veins that form in a treated area with sclerotherapy. This is from the inflammatory process and will resolve in a few months. Phlebitis – If you feel ropy veins or lumps under the surface of the skin in an area that was injected then we can treat you with Naprosyn or other inflammatory medications to relieve this as well as use of heating pads. Infection – Can rarely happen at injection sites. Please let us know if you have Diabetes or are on immunosuppressant medication. Migraines – Patients with a medical history of migraines may have these induced with sclerotherapy. Please tell us if you have a history of migraine headaches. Stroke- Rarely in a few cases, there have been reports of a mini-stroke. Please tell us if you have visual disturbances, weakness in an arm or leg or difficulty talking. We use the sclerosants polidocanol and glycerin for sclerotherapy. These are very safe medications. We do use varying concentrations depending on each patient’s condition, especially with a history of allergic reactions. We do not perform sclerotherapy on pregnant or breast feeding women. You must wear compression stockings for 7 days after each treatment to obtain maximal benefit. Please do not smoke while undergoing treatment. This will delay healing and may complicate your treatment outcomes. 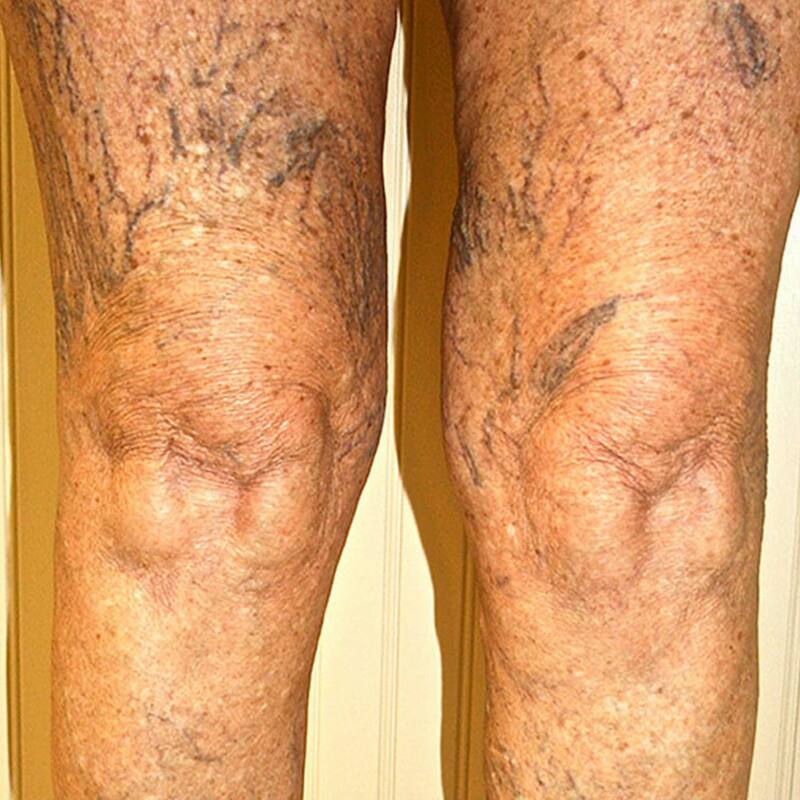 Before & After Sclerotherapy on Spider Veins. Use the handle to slide left and right.